When working in this, or any freelance industry it is important to have a project on the go virtually at all times. I am a big believer in the phrase ‘work breeds work’, meaning that if you are busy you will continue to be busy. I also like the theory that I once heard a Hollywood actor describe, ‘have one film you are filming, one film you are promoting (which you recently filmed) and one script you are reading’. This is a method I have tried to stick to in my career. The ultimate example of this in my world is where one tour finishes and another starts the following day, but is very rare when you take into account rehearsals, pre production etc. However I was ‘lucky’ enough to experience such an event earlier this year. 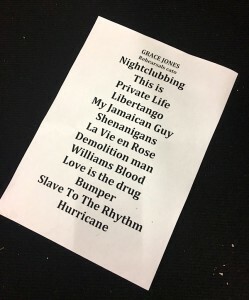 I had dates in my diary from Grace Jones, who is a long-term client of mine, that were confirmed in late 2017. These dates were fixed and couldn’t be changed or depped out due to the nature of the tour. The dates would see us tour Australia and New Zealand for two weeks at the end of February/ beginning of March. As this was a trip abroad, flights had been booked in my name, and also a visa had been purchased for me by the artist to allow the tour to happen – these elements make it virtually impossible to change plans except in a genuine emergency. 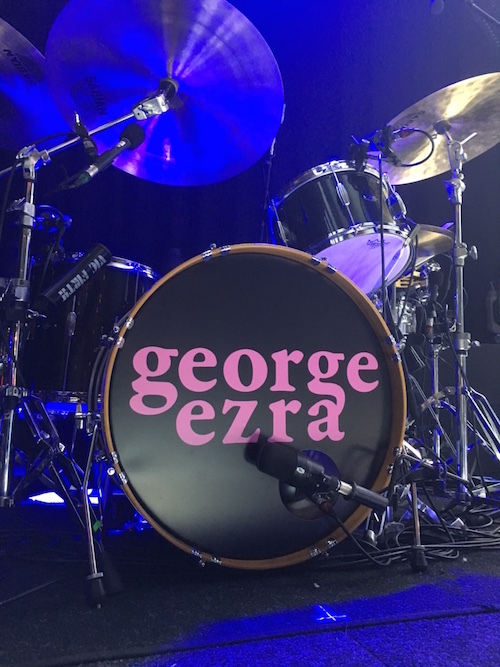 Shortly before the Grace Jones run started, a good friend of mine in the industry asked me if DrumTechSupport could supply a tech for a new campaign with George Ezra. Having seen the dates I realised that I could personally commit to the campaign as the dates slotted in and around things I already had confirmed – apart from one – Grace Jones. 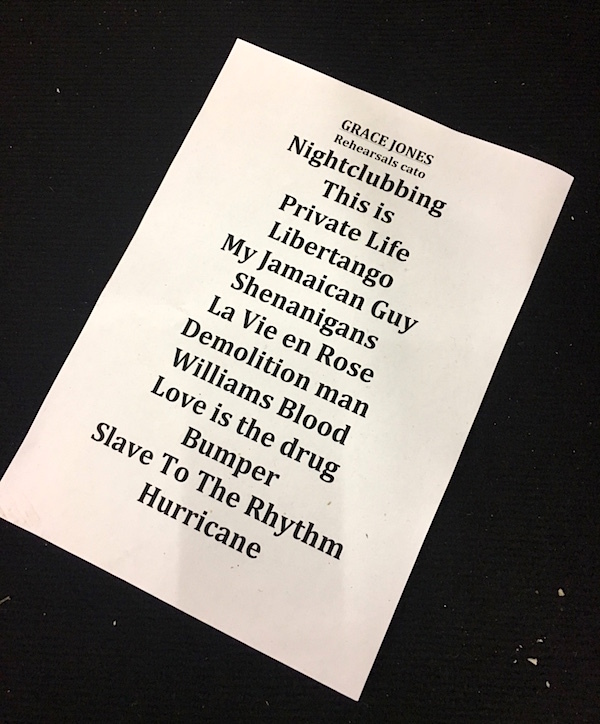 The Grace Jones tour ended in New Zealand on March 3rd at a Festival called Auckland City Limits. The George Ezra tour started in New Zealand on March 3rd at a Festival called Auckland City Limits. What were the chances!! Although this seems like a dream scenario in reality it would take a lot of planning and understanding from both parties to make it work. The facts were as follows George Ezra was on at 17.15-18.00 on the Aroha stage. Grace Jones was on at 19.45-21.00 on the Tamaki stage. Grace Jones had a 1hr change over which meant I would have to be clear of the GE camp by 18.40 at the latest to stand any chance of making this work. It also meant that I would have to have pre set the GJ rigs before the GE starts. At this point I had no idea how far the stages were apart from each other. The GJ run started with a few days rehearsals at Cato in late February. 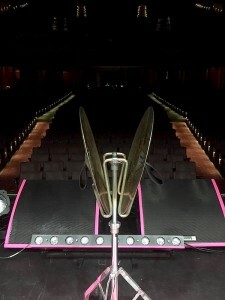 This gave the band a chance to run over some old material and fine-tune any of the songs for the upcoming shows. The gigs that we would be doing were a mixture of festivals and our own shows. All of the key equipment would be being freighted from London across to Australia – a total of 37 pieces. 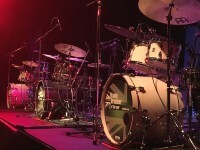 Drums/percussion would be taking minimal equipment; we would be hiring full kit and perc rigs locally. The tour began with a long flight from London to Sydney and luckily for us straight into a day off to acclimatise. I took the opportunity to spend the day with my good friend Steele Turkington of Kentville Drums discussing Kangaroo hide heads amongst other things. The first gig of the tour was a late evening headline slot at the Sydney City Limits Festival. Festivals are always a bit of a compromise for large acts and this was no different for GJ – the show which she likes to put on is tricky in a festival setting. We persevered and the show was huge success; I even managed to bump into some old friends from The Libertines camp who were doing the same festival. From there we headed to Melbourne for our own show at the wonderful Palais Theatre. Positioned near the sea front a few mins walk from our hotel the event had a much more relaxed feel than the festival in Sydney. 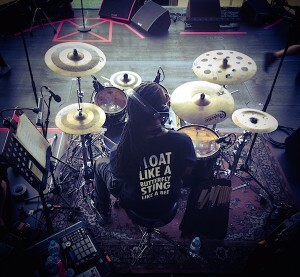 For me it meant another new kit and another new set of perc – in fact every show on this run would be brand new gear so no chance to mark up anything for quick assembly. The next morning we took an early flight to Adelaide in preparation for our headline show at the arts festival the following day. 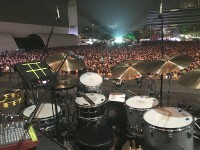 Although billed as a festival, GJ was opening the event so it meant that we had full control of the stage etc. This was to be our last show in Australia before heading to Queenstown on the South island of New Zealand. This also meant the end of our 37 pieces being ground transported between shows – for our last few trips we would have to hand carry everything on commercial planes to make the shows happen. 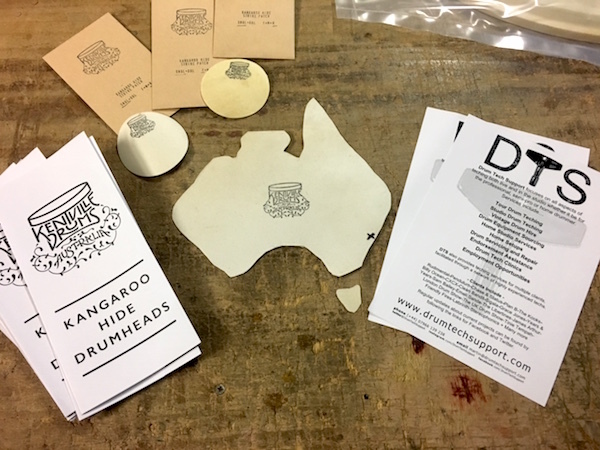 With the gig over, we packed away carefully and made sure of the piece count and the items within each case for carnet reasons. We loaded them into a safe luggage room at the hotel in readiness for the flight the following day. Traveling with a large group of people (each with their own piece of luggage and hand luggage) and a large amount of extra luggage can be a challenge at times, but as long as everything has been planned in advance and there is a system in place it should be fine. This being the first one of the run, and the first one with this group of people it was slightly more challenging than usual. Upon arrival in Queenstown we discovered that one piece was missing – luckily through no fault of anyone on the tour. The item had been left off the plane and was due to arrive the following morning well in time for the show. The headline show in Queenstown was attended by 15% of the town’s population and we were told they could have sold the tickets twice over again, but the routing of the tour didn’t allow for extra dates. After the show we again packed the 37 pieces ready for hand carrying from Queenstown to Auckland however this time I wouldn’t be with the team. This was the day that I had been thinking about for a long time. The planning, and with the cooperation of the GJ Tour Manager I was able to take a much earlier flight that the rest of the GJ crew. I traveled from the hotel in Queenstown to the Airport, took the flight, landed in Auckland, jumped in an Uber and made my own way to the festival – although this seems an easy prospect, when arriving at a festival site in a non approved vehicle with no accreditation it can prove difficult to gain access. I managed to meet some very helpful people who pointed me in the direction of accreditation – I explained my situation and showed them my Sydney City Limits pass (the sister festival) and I was sorted. Fully accredited for both acts I then asked for a site map and to my huge relief found out that the stages that GE and GJ were playing on were right next to each other!! I got a buggy round to the stage at around 9.30am and to my surprise the stages were joined together – they were run as an A/B or Flip Flop stages like at a lot of European festivals (when one stage finishes the other starts immediately). I met with the stage manager and explained my situation about looking after the two acts today. He was extremely understanding and appreciative of the situation. 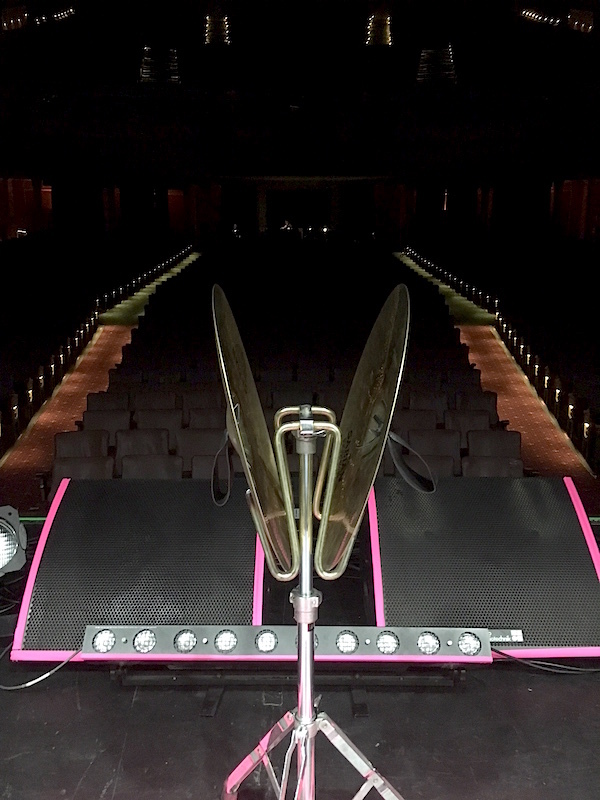 My first task was to secure risers and find the hired backline for the GJ drum and perc setups – because I knew the rigs so well now it meant that I could hopefully have them set or part way set before the rest of the GJ crew arrived with the 37 pieces at 11.30am. I also managed to look at the hired gear for the GE show (bear in mind this was my first time in doing a gig with GE and I had only seen the setup briefly once before) before their gear and crew would arrive at 12 noon. A hot and sweaty few hours later I had done as much as I could on the GJ rigs, the hired drums were fully set on a riser apart from the extra pieces I needed from our flight; the hired perc was assembled on the floor ready for a riser when it became available later in the day. I helped unload the GJ gear upon arrival and then turned my full attention to the GE build. In the time from me agreeing to do the GE gig and this first show I was also asked to help look after the keyboards as the keyboard tech couldn’t make the shows. 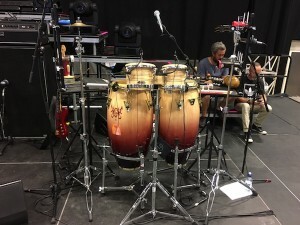 I started worked on the hired C&C Kit, which had already been used by a few other bands on the bill – I wasn’t expecting this and tried hard to make the best of a not ideal situation. Building the kit with drummer Fabio de Oliveira for the first time took a little longer than I expected – we kept being moved as the different acts took to the stage. Once he was happy I turned my attention to working with James Wyatt (keyboard player and MD) to build the keyboard rig, again I was relying on pictures taken by the previous tech. In what felt like no time at all and without a break since getting up at 4am it was stage time for the first of my two gigs; GE. Not knowing what to expect and in full survival mode I think we were ready – only to be told two minutes before stage time that the keyboard tech starts the show, no pressure! The show went without a hitch (I think) and was over in what seemed like a matter of seconds. We quickly rolled off the stage and I began to pack away what I could with huge help and understanding from Henry Spenner and Mike Timm, my fellow crew on GE, before rushing to the GJ change over.